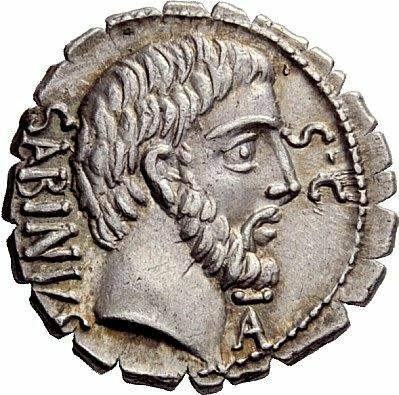 T. Vettius Sabinus was one of the moneyers for the year 70 BC. He later served as Praetor in 59 BC. Gens Vettia was a plebeian family of Rome built at the end of the Republic . The Vettii then grew in importance during the Empire , when their name often appeared in the Fasti . A branch of the Vettii lived in the village of Vezza d'Alba , which in fact took its name. Also in Pompeii there are traces of owners belonging to the gens: Aulo Vettio Caprasio Felice was owner of two properties, while Aulo Vettio Restituto and Aulo Vettio Conviva, rich freedmen, lived in the famous house of the Vettii , one of the greatest examples of Roman art and architecture of the first century. In Pompeii the Vettii family was one of the wealthiest in 79 AD , the year of the eruption that destroyed the city.